Does wine make you fat? Can you drink wine while you’re on a diet? What about diets like paleo, keto, South Beach, Atkins and gluten-free? In recent years some winemakers have started producing or re-labelling low-carb and low-calorie wines that cater to or many and varied special diets. Are they really worth it or is it just a fad? That’s exactly what we’re going to dive into this week as we explore how our bodies process alcohol, the surprising statistics about weight gain and wine and whether you should buy a bottle of low-carb wine on your next trip to the store. Why is Bridget Jones my dieting heroine? Does the calorie count of wine factor have an impact on my consumption? What do the studies show about weight gain and wine? How does the body’s processing of alcohol differ from food? 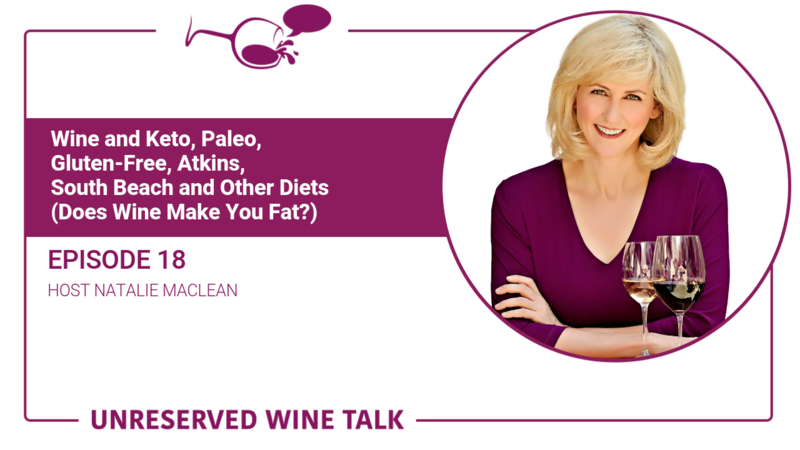 What do the Atkins, South Beach, keto and paleo diets say about wine? Do the low-carb wines have fewer calories? Is there a commercial case for low-carb and low-calorie wines? Does wine make you fat? Can you drink wine while you’re on a diet? About diets like Paleo, Keto, South Beach, Atkins and gluten-free? How does wine fit or not with those programs? That’s exactly what we’re going to dive into this week. Before we get started, I’d like to give a shout out to Gilles Monvoisin who emailed me about episode 16, which was about the difference between organic and biodynamic wines. So if you missed that one, go back and take a listen. Gilles says quote: “Hello Natalie, We are a family of three from Ottawa who is currently on an adventure in southern France in the Langue-Roussillon/Corbière region. We live in the village of Montlaur (pop. 500) where there are five wineries and dozens more just 1km down the road. You spoke about bio wines last week on the podcast. I would say bio wines are the norm around here with all the smaller wineries producing them. We have tried a few of these wines and I’d say, for the most part, they were pretty good. Needless to say that we have tried many wines! Our adventure is ending soon as we will be going back home in early April. Thank you for keeping us informed. P.S. I’m drinking a cheap rosé at the moment. Gilles also emailed me a lovely picture of a glass of the rose on a table in the backyard, with all the flowers blooming. I’m so glad that you’re enjoying the podcast during your family vacation, Gilles! I love to share reviews of this podcast for those of you kind enough to post them on Apple podcasts, social media or email. If you want me to mention your website or social media handle, please include that in your review, along with your name. I want to celebrate you and let others know how to connect with you online. By the time I publish this podcast, there’ll likely be yet another a new study about wine and diet or health, so I suggest that you always look for the latest findings. Also, I’m not a doctor or a nutritionist, so this podcast is not meant as medical or health advice. Always talk with your doctor when it comes to diet, wine consumption and other health-related issues as everyone is unique in body chemistry and history. If you’re interested in more wine and health issues, from cancer and heart disease, to diabetes and dementia, go back and listen to episode 5 with Dr. Edward Miller. I’ll include a link to that episode in the show notes at nataliemaclean.com/18. My dieting heroine is Bridget Jones from the movie of the same name—not because she was that successful in losing weight but because she never abandoned her glass of chardonnay (and still managed to snag Colin Firth). That said, here’s a confession: knowing that wine adds to the calorie count does help me to keep my intake moderate. It’s one of those natural consequences, along with a cruddy next day, that keeps me in line. I need those consequences. Do you? I’m not alone here, am I? The good news is that you can drink wine without getting fat. When it comes to both calories and carbohydrates, moderate wine drinking won’t ruin your diet. Wine has no cholesterol, sodium or fat, and it’s low in carbohydrates. Several studies indicate that drinking a glass or two of wine a day may have little effect on our weight. Regular, moderate wine drinkers tend overall to be slimmer than teetotallers, according to a study published in the European Journal of Clinical Nutrition. A 1991 Harvard study, which followed 138,000 men and women over ten years, found that increasing their alcohol intake didn’t cause the subjects to gain weight. In fact, the women decreased their body weight by an average of about 15% instead of gaining the weight predicted according to the calories they consumed. Intriguingly, the men’s weight stayed the same. Scientists are mystified about this because it runs counter to the expectation of wine being fattening since it does add calories and should give us the munchies. Wine raises blood-sugar levels and then drops them quickly—which can result in food cravings. One reason for the lack of weight gain may be that the human body treats alcohol like a toxin. So unlike most foods, wine is processed by the liver, rather than the stomach, to remove it from our system quickly. Our livers convert most of the wine into a relatively benign acetate, which it releases into the blood. Very little is turned into fat; and the body burns this acetate for fuel before it starts on its own stores of fat. As well, it’s thought that the anti-oxidants and flavanoids in wine possibly also accelerate the breakdown of body fat. Of course, calories consumed aren’t the only predictor of weight gain; other factors play a role too. For instance, moderate drinkers tend to have healthy lifestyles that include good diet and exercise. Perhaps they also have a natural tendency to be slimmer, with higher metabolisms. For the gender difference, some scientists hypothesize that women may metabolize alcohol differently from men: the calories in wine somehow burn more quickly. Just how many calories are there in alcohol? All alcohol, including wine, contains seven calories per gram. That’s less than fat itself, which has nine; and more than the four calories in both protein and sugar. In terms of what you actually drink, a five-ounce glass of dry red or white wine has on average 110 calories. The total calories per glass depends on sugar and alcohol content—and varies from wine to wine. The alcoholic strength is expressed as a percentage of the bottle by volume, and is usually noted in small type at the bottom of the label. Alcohol contributes more calories than sugar. For example, a six ounce glass of slightly sweet German riesling, with just 7% alcohol, will still have fewer calories (about 110) than a dry, robust Australian shiraz with 15% at about 175 calories. Over the past five years, the level of alcohol in many wines has been increasing steadily. This is particularly true for wines from warm climates in Australia, Chile and California. Grapes are being picked later in the season when they’re riper and laden with sugar, and consequently, get fermented into higher-alcohol wines. The combined sweetness and alcohol in dessert and fortified wines also make them caloric. For example, a two-ounce glass of port at 20% alcohol with 10% residual (left-over) sugar has about 300 calories. By contrast, a 12-ounce bottle of beer has 150 calories and an 8-ounce glass of whole milk has 160 calories. For people on the Atkins Diet (as more than 60 million North Americans are now), dry wine looks even better. Carbohydrates are essentially sugars, either simple (honey, sugar, candy) or complex (fruit, vegetables, bread). A slice of bread, for example, has about fifteen grams of carbohydrates. Although wine derives from fruit, dry wine isn’t considered a carbohydrate because the fermentation process converts all the grape sugar into alcohol. You sometimes find the sugar level of a wine on the store shelf tag expressed as a number, with “0” meaning completely dry, “1” meaning it has a little sweetness and so on. A five-ounce glass has just 1.25 grams of sugar—well under the seven grams, that’s considered low-carb, which would have made the late Dr. Atkins happy. Actually, both the Atkins and South Beach diets recommend cutting out wine altogether during the initial two-week “induction phase,” because your liver has to process it before your body can start burning fat. This is similar to many Keto diet recommendations, especially for the first thirty days so that your body starts burning fat immediately rather than the alcohol in your system. After that, experts say that you can stay in ketosis, that state of burning the body’s stored fat, and enjoy a moderate amount of dry wine. The Keto recommendations are pretty much the same for those on the Paleo Diet. Most wines are considered gluten-free because they’re made from grapes not grains. However, a few winemakers use a flour or wheat paste to seal the oak barrels in which wine is aged. This may result in less than 20 parts per million of gluten in the wine, which is miniscule. But for a person with celiac disease and high sensitivity, even this amount may cause a reaction. So check with the winemaker to be sure. Some of these diets may be faddish, but several wine producers have taken notice. Several years ago, an American wine and spirits conglomerate, launched two low-carb wines: One.6 Chardonnay and One.9 Merlot. Their names indicate the carb counts per five-ounce glass, which is only half of what’s in most wines. The secret, apparently, is a “powerhouse yeast” that ferments all the residual sugar in the wine. However, this also increases the calorie count. The low-carb wines have alcohol levels of 13.5%, making them full-bodied both in the mouth and on the hips. One.6 chardonnay has 120 calories per glass; One.9 merlot has 125. Other companies, rather than formulating new wines, have simply relabeled existing brands. Another American producer created bottle-neck labels for its California wines such as Beaulieu Vineyard BV Coastal, Sterling Vintners Collection and Century Cellars, to indicate that they’re low-carb and to give the calorie counts. The company is also using this labelling for some of their spirits, such as Smirnoff vodka, though the mixers that often accompany spirits aren’t low-carb. Several years ago, the U.S. Alcohol and Tobacco Tax and Trade Bureau ruled that wine producers could include such information on their labels. Until then, wine had never been considered a food and therefore it was never required or permitted to advertise health benefits. But the Bureau has reservations about the practice. The irony, of course, is that all dry wine qualifies as low-carb, whether it says so on the label or not. And for different marketing reasons, other wine producers are hesitating to jump on the low-carb bandwagon. Some believe it would give consumers the impression that their other wines, not being labeled, are therefore high in carbohydrates. Others think that these claims would diminish their upscale image. But if the initial sales are any indication, such fears may be groundless. Within two weeks of announcing their new low-carb wines, the company received orders for more than 200,000 cases. The beer market has had similar success: when Michelob Ultra low-carb beer launched, it became Anheuser-Busch’s fastest-growing brand ever. Low calorie light beers comprise about 40% of the U.S. beer market. Is it even worth trying to save a couple of carbohydrates by drinking these wines? While every carb may count for some dieters, carbs from wine represent a small fraction of the total 50 to 60 carbs recommended in the Atkins Diet. Other winemakers are exploring low-calorie products. The Australian winery Swaying Willow launched a wine that Bridget Jones would love: a diet chardonnay, with most of the alcohol spun out in a centrifuge. It has just 35 calories per five-ounce glass, and 1.2% alcohol. Several wine critics who’ve tasted it say that it lacks both body and taste. Weight Watchers has also launched its own label of low-alcohol Riesling in the U.K., with just 80 calories per glass. Its grapes come from the Mosel-Saar-Ruwer region of Germany, a cool climate where the fruit doesn’t reach high levels of ripeness or sweetness. The wine is worth just one point out of the daily twenty points that Weight Watchers allows its dieters, as compared to one-and-a-half points for all other wines. A low-cal bubbly seems like a rather niche market; and yet, two French champagne houses—Laurent Perrier (Ultra Brut) and Piper Heidsieck (Brut Savage)—have produced low-alcohol styles. According to Joan Oliphant-Fraser, author of The Champagne Diet and also a Dame Chevalier de l’Ordre des Coteaux de Champagne, some of the biggest fans are racing jockeys who have to keep their weight down but still want to celebrate their victories in style. Of course, when it comes to wine, moderation is key. Drinking more than one or two glasses a day will pile on the calories, as well as increasing your chances of liver damage and other health problems. But let’s look at it the other way around: If we cut down on the fatty foods and sugary drinks, there’s plenty of dietary room for a glass or two of good wine a day. Such moderate tippling uses up only about 6% of our recommended caloric intake, leaving plenty for other nutrients alongside our wine. And when it comes to eating raw carrot sticks and skinless chicken, a little vino sure makes life more palatable. Bridget Jones may not have known that, but Renée Zellweger, who played the character, appears to have. She shed thirty pounds after filming for the movie was finished. My secret hope is that she was still drinking chardonnay when the cameras stopped rolling. How about you? Do you think about the calories in wine? Do it have an impact on your consumption? Are you on one of the diets I mentioned, and have you managed to keep wine in your life? Share that with me please! You can tag me on Twitter or Facebook @nataliemaclean, on Instagram I’m @nataliemacleanwine. You’ll find links to my wine reviews, all of which list both the alcoholic and sugar content of each wine, in the show notes, at nataliemaclean.com/18. Next week, we’ll chat with Arvid Rosengren, who won the World’s Best Sommelier Competition. He’ll share his best tips on choosing wine from a restaurant list as well as pairing wine and food. I can’t wait to share more personal wine stories with you. Thank-you for taking the time to listen to this one. I hope something great is in your glass this week!